Having introduced the Aria Class River Boats between 2006 and 2009, APT has now launched its Concerto Class River Ships with the first of two vessels commissioned in May 2010. APT’s newly inaugurated 162-passenger Ms Amabella is already a hit with the cruising community. At the Australian Cruise Passenger Readers Choice Awards in December 2010, Ms Amabella took the Best River Cruise Ship award. The Concerto Class river boats build on the popular features of the Aria Class. These ships are slightly larger and introduce the concept of Twin Balcony Suites, i.e. an outside balcony as well as a conservatory-style inside balcony. There are three specialty restaurants providing seven dining choices. The intimate Erlebnis Chef’s Table, in which 24 guests can enjoy a degustation menu prepared by a private chef, is a highlight of APT’s dining experience. Whisper-quiet engines for peaceful cruising – if you’ve cruised on earlier river boats, you’ll appreciate this improvement. 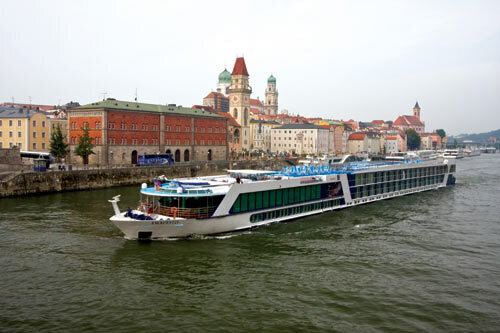 The Ms Amabella cruises the rivers of Austria, Germany, Holland, Hungary, Slovakia and Switzerland. APT is partnered with AMA Waterways and the Ms Amabella has been chartered by APT during its first year for the Australian cruise market. It will be marketed exclusively to Australians. Note: Picture above is of the sistership Ms Amacello.